In this quick tutorial you'll learn how to draw a Conus in 4 easy steps - great for kids and novice artists. At the bottom you can read some interesting facts about the Conus. Step 1: First, we will make the shell of the conus. 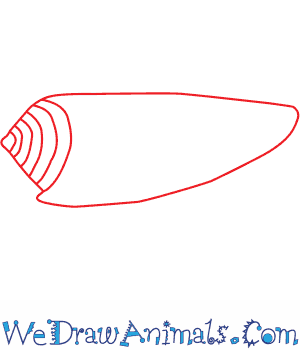 It is cone shaped, with half circles that get smaller on one end. Step 2: Next, draw the siphon. It looks like a horn. 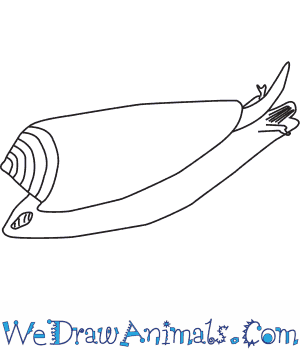 The snail can pull water in through the siphon and it also functions like a nose. 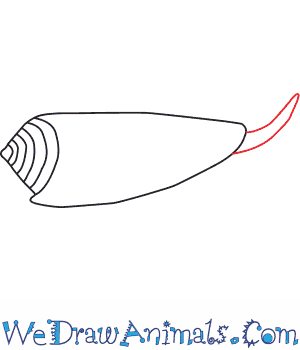 Step 3: Then, we'll draw the foot and operculum. These help the snail move and also protect it when it goes into its shell. 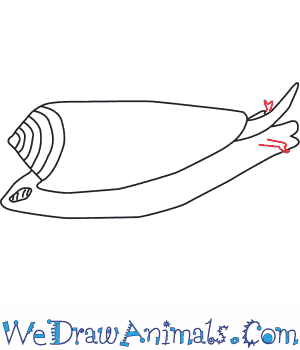 Draw a rounded triangle at one end of the shell, and bring the line around to the siphon. Give it detail by making a few bumps around the siphon and add a circle on the back. Color in the circle. 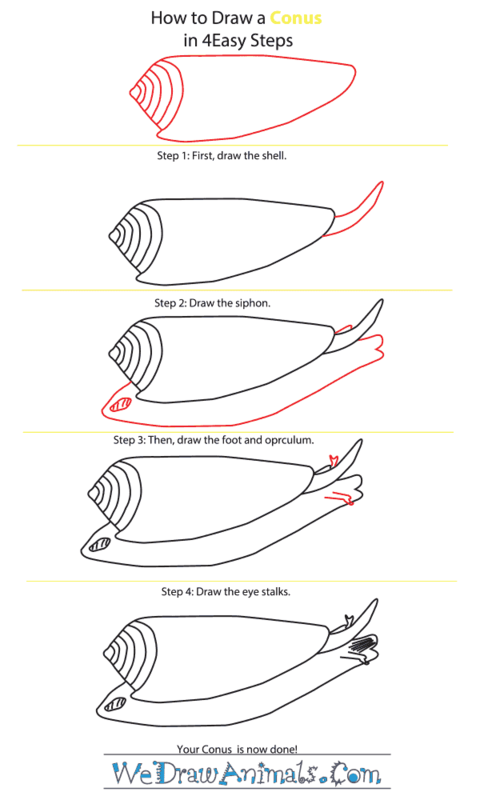 Step 4: Last, we make the eye stalks. They go on either side of the siphon, and they look like letter Ys. Congratulations, your conus is now done. 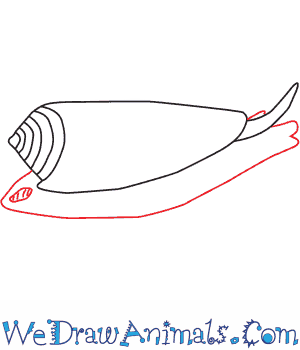 These snails have brilliant colors and patterns on their shells, so have fun coloring it in! The Conus is a member of the snail family and the scientific term for them is Conus zebroides. The name is Latin for “cone-shaped” (Conus) and “zebra-striped” (zebroides) mollusk. This species eats smaller animals of the ocean in southwest Africa. These creatures contain a shiny white shell with long brown markings running parallel to its shape. They live in the country of Angola, between the cities of Benguela and Namibe. The animal was first documented in 1845. This species grows along less than only 336 miles of the African coast. The animal can grow to almost 2 inches long. They have been considered a problem for thriving since 1996. They live in water less than 10 feet deep. Since this species lives in such shallow water, that they are easily collected by humans for decorative purposes. Other threats to their survival includes the increase of offshore drilling for oil. However, there is no proof that this animal is suffering a reduced population, and so there are currently no governmental projects to protect this species. Since there are so few square miles of habitat for these creatures, they are considered vulnerable to extinction.